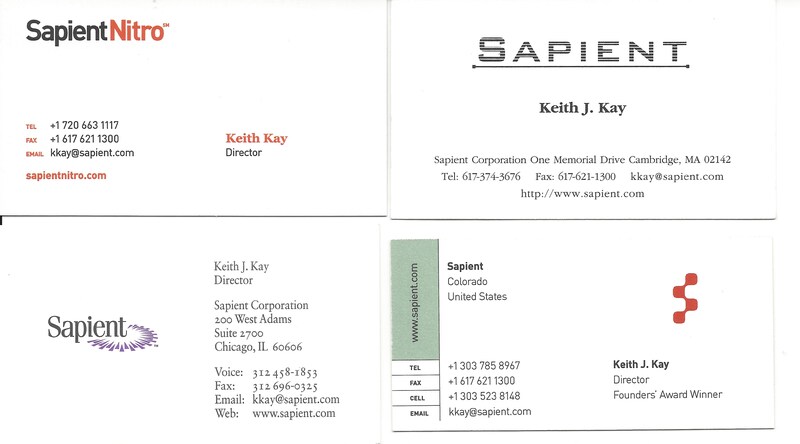 A few months ago I left Sapient, the company where I had worked for 15 years. That has been the most common response I’ve gotten, and it’s understandable as 15 years is a long time, and being a “Sape” had in many ways become part of my identity. As I wrote my farewell email, it struck me how many people I wanted to thank for the help and support in my career who are no longer at Sapient. So thank you to the innumerable people I have worked with over the years for your advice, support, encouragement and laughs – in ways big and small you made an impact on my career and my life. As I move on to a new chapter in my career, I took some time to reflect on what I learned, and want to share the 3 I feel are most impactful. These are by no means unique observations about Sapient, nor unique to Sapient. However, in my 20 years of professional experience, including other consultancies, two startups, and dozens of clients, finding a organization with these attributes is rare. You cannot talk about Sapient, especially in the early years, without talking about culture. We were obsessed with building a culture that would build a great company. How we chose to define our culture is interesting in itself, and is the subject of an HBS case study. What your culture is should be unique to each company and relate to your business context and purpose. However how you craft, promote, and use your culture is what I want to highlight here. My observation is that corporate culture is either what you get or what you do. Meaning, if your culture is a set of values that hang on the wall, rather than a shared set of expectations and values that you use every day to make decisions and shape behaviour, then you aren’t crafting a culture, and you will simply get the culture that your employees bring in with them. To make a culture a cohesive force I believe you have to use it daily, you have to talk about it with your teams, you have to visibly use it in your decision making. And most difficult of all, you have to, as we used to say, reject non-fits like a virus. Sounds harsh, but time and again I have seen people of great skill and experience who were culturally poisonous retained in organizations well past the point where the damage they were doing was greater than the benefits they brought to company. No doubt this is a hard decision to make, but forcing the conversation is the difference between believing in your culture as an asset versus a slogan. Openness means different things to different people, but in the context of Sapient it meant being direct and generous with your feedback to others, and more difficult, open to hearing the generous amount of feedback you were going to get. Every day. I believe this was essential to developing a learning organization, where at our best we were in a state of continuous improvement for years. We would debrief as a team not just at the end of an iteration, but after every client presentation, meeting, or checkpoint. During our intense workshop sessions we would debrief at lunch and the end of day. By debrief, I mean we went around the room and critiqued ourselves not just as a team but each other. Now, some feedback and coaching experts will tell you that constructive feedback should be given one on one, not publicly. And that works for individual coaching, but we were trying to raise the game of the whole team, and it worked. If everyone heard everyone else’s feedback they could learn from each other. It requires a culture of trust at the team level for sure, and it wasn’t for everyone, but if you had “purple in your blood” as we used to say, it was what you expected. Like many companies Sapient certainly focused on hiring bright, talented, ambitious people. And being in Cambridge, MA certainly gave us access to lots of that kind of talent. But it was a focus on people, and in particular people growth, as we used to call it, that I feel accelerated the growth of the company. Almost all companies today say people are there most important asset. But executives and managers at many companies don’t behave that way. At the time, Sapient made a decision to aggressively manage the growth of the entire company. So what does that mean? It meant in our case not just the feedback intensive culture and openness discussed above. It also meant constantly looking at our team, whether it was a project team, an account team, the office or region’s leadership, and actively looking for, or creating, opportunities to push people out of their comfort zones. Because we believed (and we experienced) that is where people grew the most. It was our own take on that old adage that sometimes the role makes the person. And that is so unlike most of corporate America in my experience, where if we need a new leadership role the most likely place to look for it is outside. 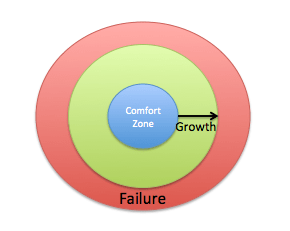 What was also really different is we used to talk about it as a whole office, and I remember we’d draw the simple diagram to the right on the board to explain, we are choosing to live right on the edge of growth and failure, because that is how we are all going to grow the most. And just as importantly, when people struggled or failed, that had to okay. It meant we knew where they needed coaching and support, and at that moment, it’s critical to dial it back a little and give them the support to work on those growth areas. Was that perfectly executed? I am sure not, and I may have been lucky in the people who I reported to, but nonetheless, that was definitely my experience for the bulk of my tenure. So that’s my two cents. Disagree or have something to add, leave a comment. What?!? You left Sapient? Again? I guess now you’ll have time to take that trip to London you’ve always wanted to take. Looking forward to seeing you on this side of the pond sometime. Now I’m off to watch US in the world cup. Go USA. Go USA. Ha ha, indeed that trip is over due. We are definitely planning a trip to Europe in the next year. Thanks Dinesh, that really means a lot to me. Keith – thank you for sharing your thoughts. It brought back a lot of memories from the “old days.” I wish you the best of luck.